I was full of praise for Cronian's previous album, 2008's Enterprise, and have been looking forward to new material from the project ever since. 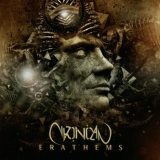 Formed by two members of Borknagar, Vintersorg and Øystein Garnes Brun, on the discovery that they had similar musical ideas for a new side-project, Cronian play a form of particularly Norwegian progressive metal, full of influences from the extreme metal end of the spectrum but always able to construct listenable and often even catchy songs out of it. Still very much walking the same post-black path that they have taken so far, Erathems exemplifies the rich, skilled songwriting and progressively-structured anthems that I associate the band with. It was the quality and sheer classiness of the band's sound that appealed so much previously, and although seven-minute-plus opener Cold Wave Eruption has a shaky start due to a chorus in the first half that doesn't quite gel with the surrounding blackened gnarliness and the second half's proggy meandering, from then on the band seem to click back into that expert groove. And it's impressive stuff; the Solefald-esque Ecocracy's recurring motif holds the loosely-bound track together well, while the following Drifting Station takes more of a usual progressive direction, initially focusing on Vintersorg's clean vocals. Moments and Monuments' synthesized horns and clean singing seem to act as a kind of break in the album after that, a complete song that takes the form of a rather beautiful interlude. Blackwater Horizon kicks things up a gear afterwards, upping the black metal influence to make a faster track that sounds the most like Borknagar's earlier days, although Cronian make room for another chorus and plenty of prog bells and whistles. And although they don't always make the songs immediately accessible – the melancholic meander of Core Resiliency is particularly obtuse – and the songs don't really fit together well enough to make Erathems feel like a cohesive album, the songwriting is always good enough to make you feel that it's your fault rather than the band's and that there's more to be uncovered with further listens. It's that sort of album, really, the sort you could listen to for months and get pleasure from, which is obviously a good thing. Despite being less cinematic than Enterprise, with less of the avant-garde variety and a slightly rawer production, Erathems is another set of excellence from two of underground metal's most talented.